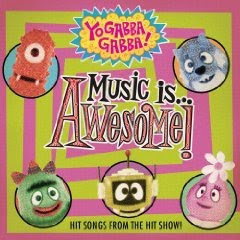 If you haven't heard of Yo Gabba Gabba then you probably either do not have a young child or you live under a rock. YO GABBA GABBA! premiered in the U.S. on Nickelodeon in August, 2007 and currently ranks as one of the most popular series on television with broad appeal among preschoolers, parents, teens and adults. The award-winning series stars DJ Lance Rock (Lance Robertson) and a cast of colorful characters, including: Brobee, the little green one, Foofa, the pink flower bubble, Muno, the red Cyclops, Toodee, the blue cat-dragon and Plex, the yellow robot. Today’s most popular names in movies, television, music and sports flock to guest star in the groundbreaking show, including Jack Black, Rachel Dratch, Melora Hardin, Tony Hawk, Biz Markie, Jack McBrayer, MGMT, Mark Mothersbaugh, The Roots, Andy Samberg, Amy Sedaris, The Shins, Amare Stoudemire, The Ting Tings, Jimmy Eat World and Elijah Wood, among others. Andy Samberg, The Roots and MGMT were among the celeb guests who appeared with the Yo Gabba Gabba! gang during a week of new episodes, which aired Monday, Oct. 12 – Friday, Oct. 16 on *Nick Jr (*formerly named NOGGIN). Additional guest stars appearing throughout the premiere week included hip-hop legend Biz Markie, teaching preschoolers how to beat box in the recurring “Biz’s Beat of the Day” segment, singer/illustrator/composer Mark Mothersbaugh (DEVO) in the recurring “Mark’s Magic Pictures” drawing segment, skateboarder Ray Barbee and musical guests Reeve Oliver, Lady Tigra and Little Ones. Yo Gabba Gabba!, currently shooting its third season, is created by Christian Jacobs and Scott Schultz and is produced by The Magic Store and W!LDBRAIN. The series airs daily at 1:00 p.m., 1:30 p.m. and 10:30 p.m. (ET/PT) on Nick Jr. These episodes will be replayed so you can still catch them if you missed them last week! Check out the YO GABBA GABBA Tour coming to a city near you. You can check out http://www.YoGabbaGabbaLive.com for more information and to purchase your tickets! Children 1 and younger will be admitted free to sit on your lap! Dexter loved the CD. He really likes dancing and he enjoyed this whole mix. He really liked Party in my Tummy and Get the Sillies Out. The songs are really catchy and I have found myself singing them all day. The CD is going to be released tomorrow 10/20 and you have your chance to win it RIGHT HERE! Please tell me who you would give it to and why you think they would like it. *Tweet this giveaway (daily) and don't forget to use @royaldixie in your tweet. Z would love this cd. I would give this to my 3 yr. old son, Duncan. He loves singing and dancing and enjoys Yo Gabba Gabba. My 3 year old Miss Quinn would love this CD. Yo Gabba Gabba is HUGE in our house! Scarlett is such a huge fan of Yo Gabba Gabba!!! She is in love with DJ Lance Rock! I think it is great to finally have a show that kids love and that parents can love too! I can't wait to hear this album!!! I am a huge follower of Dexter's Super Savvy Mom's blog. What a great source for info and reviews! I would give this CD to my 10 month old daughter. She always starts to dance when she hears music and she loves the "it is Fall" song! I would give it to my daughter, she has her third b-day soona nd she LOVES the gabbas!!! My 2+ year old great-nephew would just love this. Thanks for the giveaway! !